Explore the Southeast Cambodian destination, dip yourself in the mysterious and scared beauty of temples, statues and carvings. Visiting the PhnomPenh city with Royal Palace, Silver Pagoda and Takeo town. Visiting Sihanoukville and Tuol Sleng prison now is Genocide Museum. Visiting Kompong Thom and Angkor Complex. You will leave Phnom Penh and with stop at Tonle Bati lake and its nearby, a small picturesque Angkorian temple. We visit the quiet town of Takeo before taking a short cruise to Angkor Borei, located just few kilometers from Vietnam border. There is a small museum contains several copies of sculptures from the nearby ruins and few 4th-century artifacts. Our boat continues to pre Angkorian-style temple of Phnom Da and Asram Maharosei, a temple with ascending path over some big rocks. You then drive to Kep, a small city, served as a seaside resort for the French in the early 1900s. Three towns in the southern coast of Cambodia: Kep, Sihanoukville and Kampot remind us about the quiet residential area near the Mediterranean, with line of trees in sidewalk, wide roads, large villas and palace overlooking the Gulf of Thailand. We will be overnight in Kompot. We will explore the none-touristy Kompot town with colonial style buildings. Not only famous by durian, Kampot but also is a region with plenty of other tropical fruits such as mango, pineapple, grapefruit, custard apple and coconut. We then continue along the coastline to Sihanouk Ville, a sea resort city of Cambodia. We will take a boat trip to Ream National Park, through the stunning mangrove forest and relax in your “ privacy style “where you are on your own sand beach without disturbance from others. Overnight in Sihanouk Ville. We will have full day relax in Sihanoukville beach with beer, seafood and enjoy the sunrise before heading back to Phnompenh for overnight. On the way you could have some stops to see the cultivation of villager in the rural area. In the morning we visit Tuol Sleng prison now is Genocide Museum, the most secret part of the Khmer Rouge regime. It’s also called S-21 ( abbreviated for Security Office 21 ), a Khme Rouge's premier security camp, specifically designed for the interrogation and extermination of anti Angkar elements. We continue to Choeung Ek museum, where between 1975 and 1978 about 17,000 men, women, children and infants detained and tortured at S-21 were transported for the extermination. Leave the relics of the bad history of Cambodia we will go shopping around Russian market, enjoy the bustling daily activities of the locals. We will take a cruise to see the sunset on the Mekong and Tonle Sap river in the “Four Arms” section where the Mekong meets the Tonle Sap river before splitting into two branches. Dinner and overnight in Phnompenh. 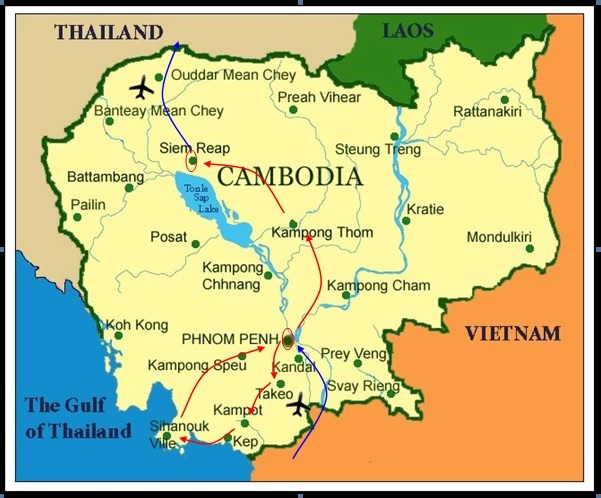 We will go overland to Siemreap this day, with first stop at Skuon town to see ( or even try ) sautéed spiders, a local food. The road conditions are basic, but in return you will get a great journey with temples, rain forests and Khmer traditional villages. You will visit Sambor Prei Kuk, a part of Chenla Kingdom, cover an aea of around 1000 arcs with hundred Pre-Angkor styled temples. We will arrive at Siemreap in the evening for overnight, with last stop at archeological “Naga Bridge” at Kompong Kdei. Today we get up early to enjoy sunrise over ancient land of Angkor area and go to the pagoda to offer food to monks. It is a traditional culture and have no meaning of beggary. You will have great breakfast with them on the ground floor of the pagoda, enjoy the hot green tea and talk about the meditation life. We continue to visit Angkor, the Unesco World Heritage starting with sacred Ta Prohm winded by the roots of giant big trees and creepers. Ta Prohm is famous by choosing for major activities of Tomb Raider acted by Celebrity Angelina Jolie. We continue to Prasat Kravan with its unique brick sculptures, Srah Srang - “The Royal Baths" was once used for ritual bathing, Banteay Kdei surrounded by four concentric walls and finally finish with Thommanon and Chaosay Tevorda temple. We explore Banteay Srei a temple with remarkable preservation of excellent carving art. We stop at Banteay Samre, a rose-colored sandstone walls are decorated by carvings and bas-reliefs before heading back to Siemreap for overnight. We explore the Unesco World Heritage Angkor by an easy biking on the roads-less-traveled. Ride along the jungle on well-paved trails, passing through local villages, you will reach Angkor Wat, highlighted by the longest continuous bas-relief in the world, carved on the walls and tell the stories of Hindu legends. 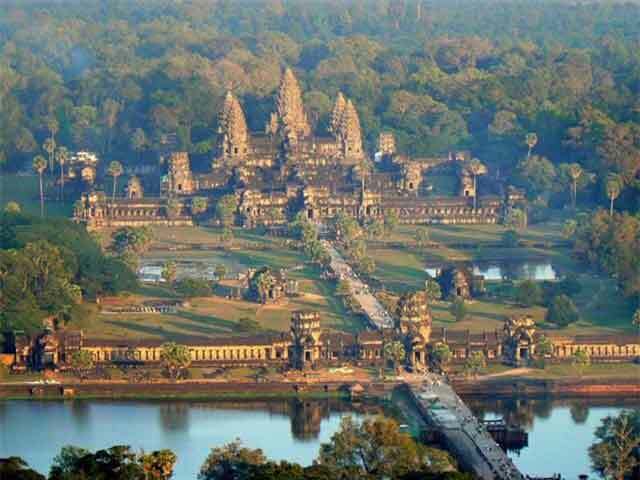 We will explore some of Angkor’s most beautiful temples including: The ancient capital of Angkor Thom, the South Gate, Bayon Temple - unique with its 54 towers decorated with over 200 smiling faces, Baphuon temple, north of Bayon represented of holy Mount Meru the residence of the gods in Hindu tradition. We will go around The Royal land, the Elephant Terrace and the Terrace of the Leper King. We stop at the less-traveled west gate of Angkor Thom before calmly relaxing at Bakheng hill for a romantic sun set view. We will return to Siemreap downtown for dinner, enjoy 1-hour foot massage and have funny time at bars and pubs at Angkor night market. Overnight in Siemreap. We will have a responsible day with visits to a local village. Your ideal travel is not only for leisure, but also helps them with sustainable income and give them the real helpful aid. We will meet the friendly host family, study their life structure then help them to complete their daily tasks from simple thing of cleaning to the hard work with cultivation in rice field, rice sorting and rice husking. We head to the local school, where children are willing to practice English with you. We stop at a pagoda to see the interesting insight into Buddhism in Cambodia and with Khmer people. We take a bull cart to go around the villages, rice field and lines of palm trees before boarding a boat in Tonlesap, the biggest fresh-water lake in South East Asia. Enjoy the bustling life of local people in floating villages with floating schools, floating restaurants, and even floating hospitals. We come back to Siemreap for overnight. The last but not least day will be a long journey west to the Beng Mele, a small county at the foot of the Phnom Kulen mountain.. It was the spring of a canal run to the great Tonle Sap Lake, which probably used to transfer sandstone and wooden blocks to build up the Angkorian monuments. Phnom Kulen is a holy mountain for Cambodian pilgrimage. We will see 1000 carvings in the sandstone 10cms under the water level, highlighted with Hindu God Vishnu and lotus flower. We continue to visit Beng Mealea 12th century temple is nearly the size of Angkor Wat but squeezed in jungles. We will be back to Siem Reap for the late onward flight. End of services.